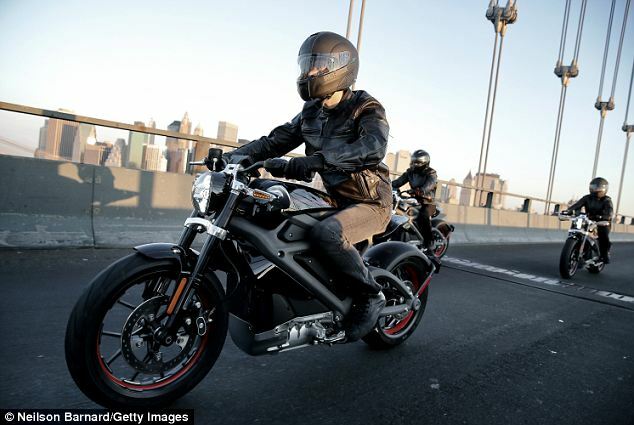 The iconic American motorcycle manufacturer Harley-Davidson has said it is dedicated to having electric powered motorbikes on the road within the next five years. 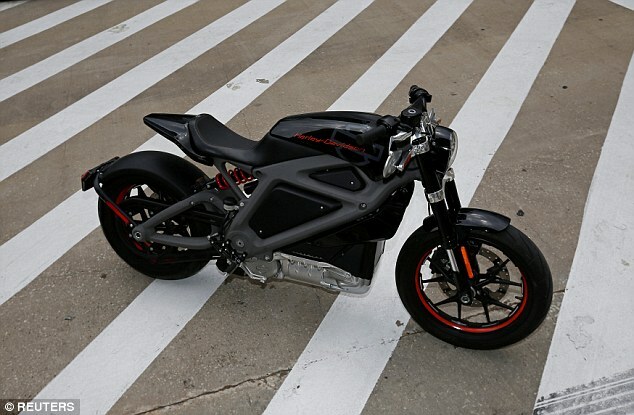 The company had been touting its LiveWire e-powered concept bike for years, but only within the last couple weeks has the firm committed to a timeline on production of the pioneering vehicle. 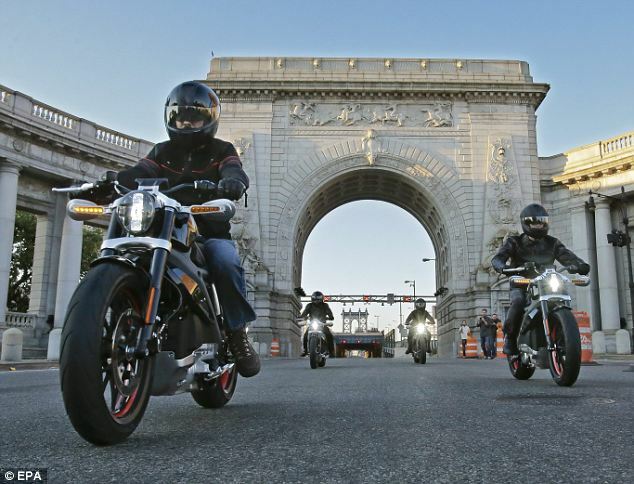 'Harley-Davidson will produce an electric motorcycle for customers within the next five years,' writes Harley Senior Vice President of Global Demand Sean Cummings in the Milwaukee Business Journal. The five-year timeline is a sensible one as it general takes five years for new bikes to go through design and engineering stages, to being fully roadworthy. 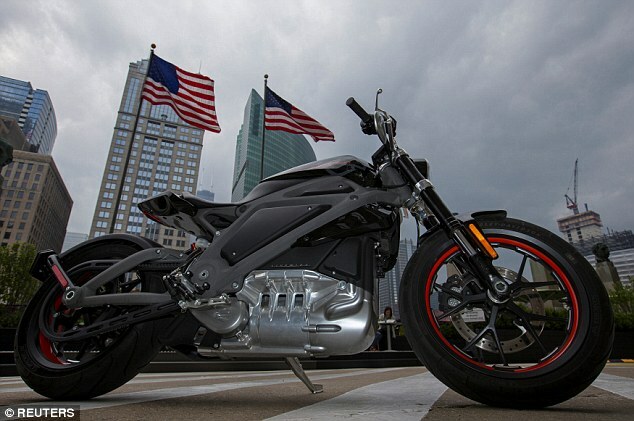 Until June, many believed the electric motorcycle idea would simply remain nothing more than a publicity stunt, but now the company says it should have electric wheels on America's roads by 2021. The company is working to increase the bike's current range between battery recharges from its current point of 50 miles to at least 100 miles. 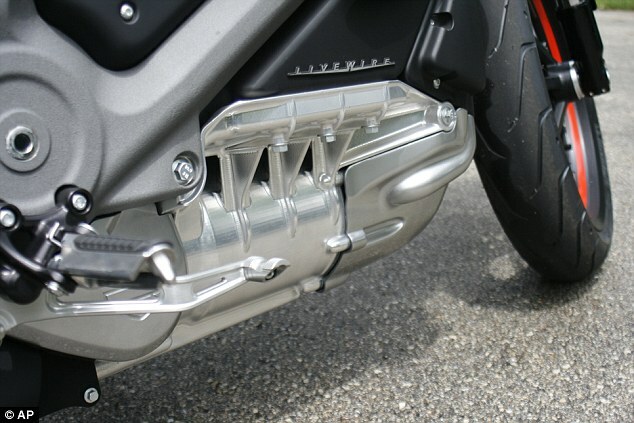 The aluminum-bodied prototypes emit a low-pitched whine, quieter than a typical lawn mower, rather than the traditional Harley rumble. Sporting a 74 hp electric motor generating 52 lb-ft of torque, the bike tops out around 92 mph, has a range of 53 miles, and its lithium-ion battery pack can be recharged in 3.5 hours. The bikes are a big part of the company's effort to engage young adults and reduce reliance on aging baby boomers. 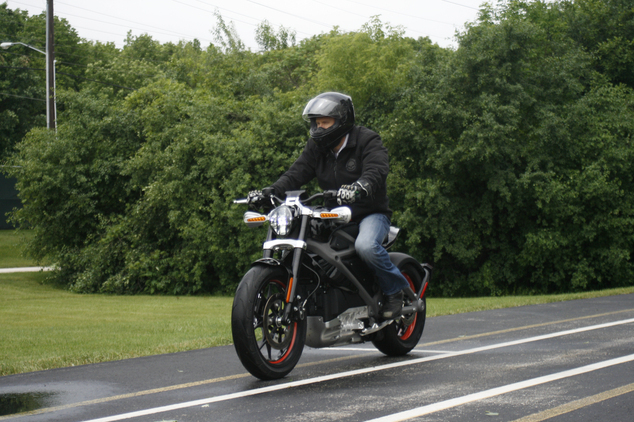 The three dozen LiveWire prototypes produced by Harley, and tested by 6,800 people at dealer events around the U.S., have a range of roughly 50 miles between battery recharges, depending on driving speed and conditions. 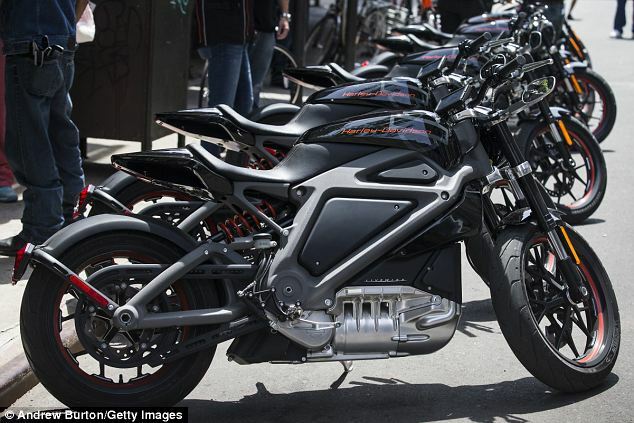 Harley and others say they believe electric motorcycles will appeal to young, urban adults concerned about pollution from gasoline-powered versions and eager for a lightweight machine that can thread through traffic. 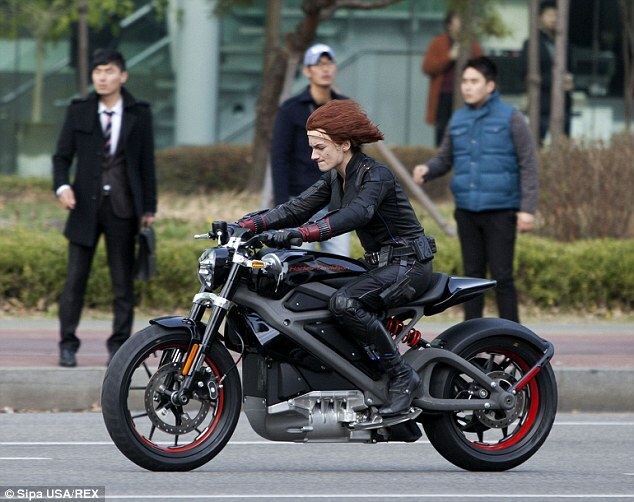 After compiling data from the pilot project with about 40 Livewire prototypes, the company launched the development of its production version motorcycle, which should feature 'at least double the range' of the prototype. 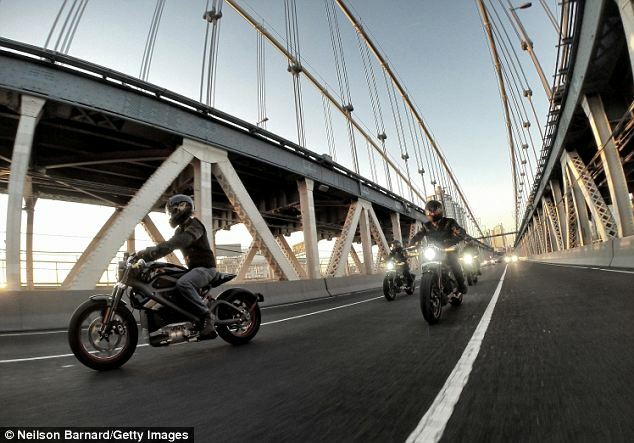 At a launch event in New York City in 2014, riders took iconic motorcycle brand's experimental machine purring across the Manhattan Bridge and through the streets of the city centre. 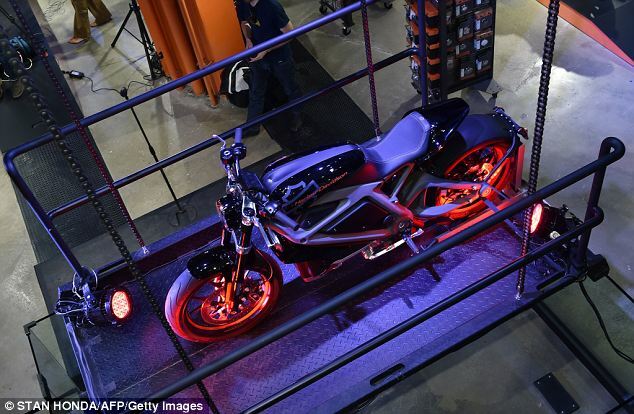 But across the country in Los Angeles, Harley fans complained that the quiet new electric models had dispensed with part of the brand's main and enduring appeal. 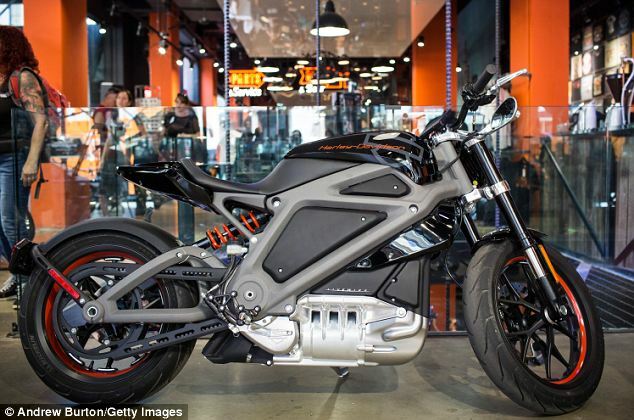 'When I ride a motorcycle, it's that engine vibration, the sound, the kind of visceral experience you get that you can't get with an electric motorcycle,' said a customer at Harley's dealership in LA's Canoga Park suburb. 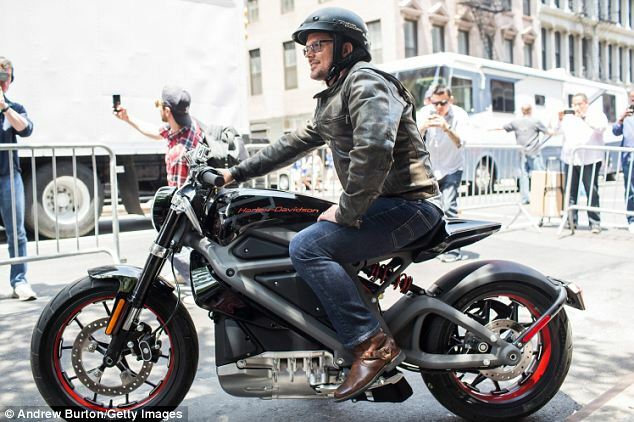 'If I'm going to buy an electric motorcycle, I might as well buy a scooter or something like that,' he told CNBC, which noted that many Harley buyers tune up their bikes to make them louder. 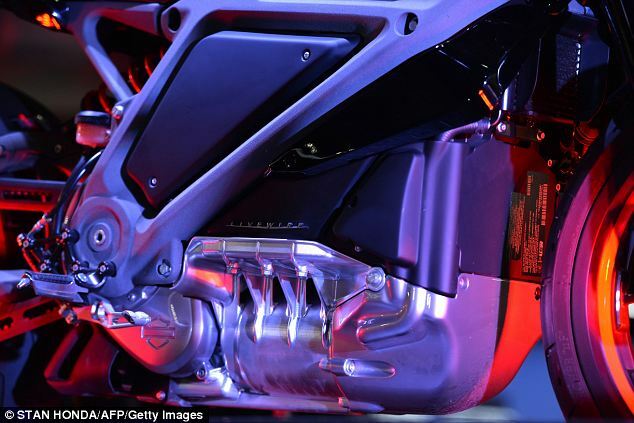 Like other electric vehicles, the engine on Harley Davidson's Livewire prototype is silent, although the meshing of gears reportedly makes a hum like a jet aeroplane taking off, quietly. With its rather modest 74 horsepower and a top speed of 92 miles per hour, it's also not likely to appeal to the speed demon market - despite its claimed acceleration to 60mph in four seconds. 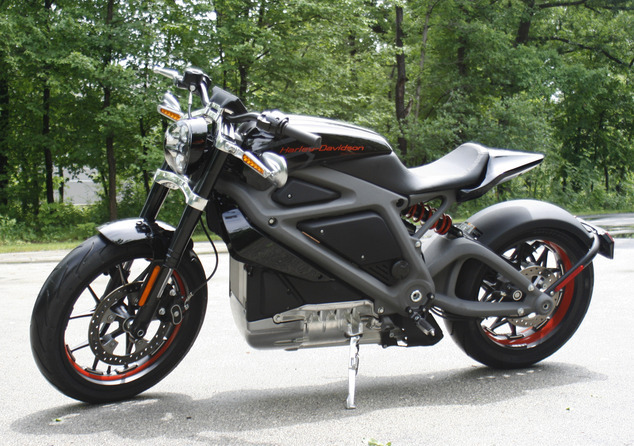 Some see the venture as a risk for Harley because there's currently almost no market for full-size electric motorcycles. The millions of two-wheeled electric vehicles sold each year are almost exclusively scooters and low-powered bikes that appeal to Chinese commuters. In addition the company has little experience in such an emerging technology. 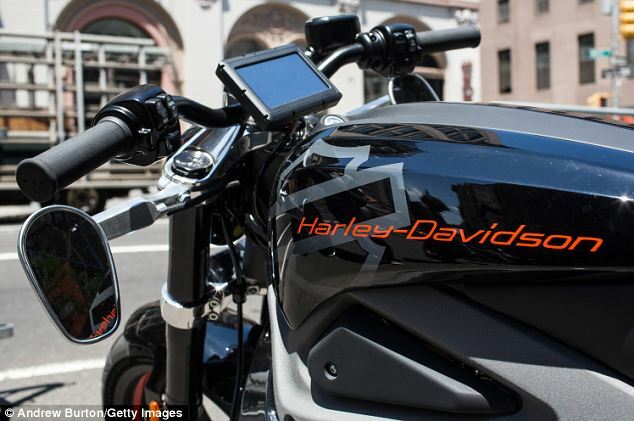 But one analyst said investment by a major manufacturer could help create demand, and Harley Davidson president Matt Levatich emphasized in an interview with The Associated Press that Harley is interested in the long-term potential, regardless of immediate demand. 'We think that the trends in both EV [Electric Vehicle] technology and customer openness to EV products, both automotive and motorcycles, is only going to increase, and when you think about sustainability and environmental trends, we just see that being an increasing part of the lifestyle and the requirements of riders,' Levatich said. At the same time, Mr Levatich and others involved in creating the bike predicted it would sell based on performance, not environmental awareness. With no need to shift gears, the bike can go from 0 to 60 miles (96 kilometres) per hour in about four seconds. The engine is silent, but the meshing of gears apparently emits a hum like a jet airplane taking off. 'Some people may get on it thinking, 'golf cart,'' lead engineer Jeff Richlen said. 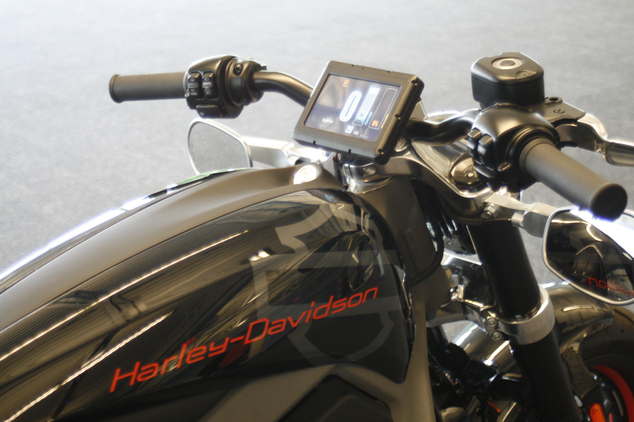 Harley-Davidson Motor Company is the largest manufacturer of heavyweight motorcycles in the world. William S. Harley and William A. Davidson founded Harley-Davidson in Milwaukee, Wisconsin in 1903. 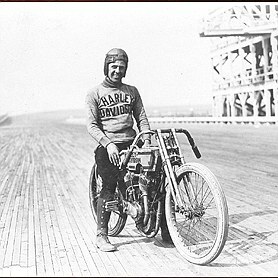 The first documented appearance of a Harley was in a Milwaukee motorcycle race at State Fair Park in 1904 (pictured right). A year later, Carl H. Land of Chicago, the first Harley dealer, sold three bikes out of the initial line and by 1907 production had increased to 150 motorcycles. During this time, the firm also sold motorcycles to police departments and ramped production to 450 motorcycles by 1908. During World War I, Harley provided 15,000 motorcycles to the U.S. marking the first time that the motorcycle had been adopted for combat service. By 1920, Harley was the largest motorcycle manufacturer in the world with more than 28,000 motorcycles sold in 67 countries that year. From 1929 to 1933, sales of Harleys fell from 21,000 to 3,700, but this was reversed when more than 90,000 motorcycles were produced for the U.S and Allied Nations during World War II. The brand's reputation was damaged in 1952 when Harley was charged with restrictive practices after requesting the U.S Tariff Commission place a 40 per cent tax on imported motorcycles. 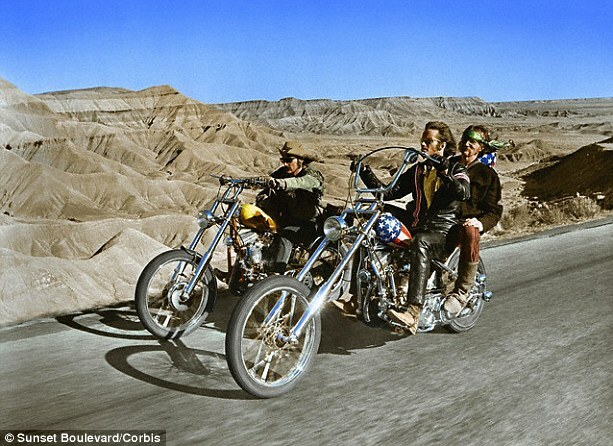 Harley later became synonymous with the Hells Angels biker gang, too. American Machinery and Foundry bought Harley-Davidson in 1969, but Harleys became more expensive but of poorer quality. 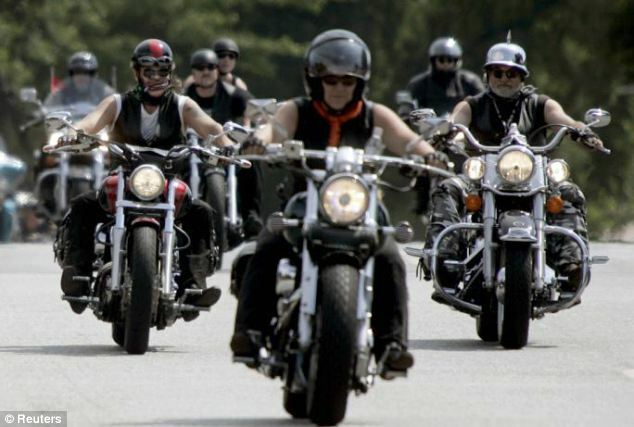 Sales dropped so significantly that the company almost went bankrupt, but in 1981, American Machinery and Foundry sold Harley-Davidson to a group of thirteen investors for £47 million ($80 million). In 1983, Harley established the Harley Owners Group (HOG), a nickname that has been given to Harleys from the 1920s, when a team of farm boys used an actual pig as their mascot during motorcycle races. In 2000, Ford began making a Harley-Davidson edition of its popular F-150 pickup truck. In 2008, the Harley-Davidson Museum opened in the Menomonee River Valley. According to Interbrand, the value of the Harley-Davidson brand decreased by 43 per cent in 2009, linked to a significant drop in the company's profits over the previous two quarters. Except for the modern VRSC and Street model families, current Harley-Davidson motorcycles have stayed true to the classic Harley designs. This is why the move to an electric model signifies a shift away from its heritage. Harley-Davidson's attempts to establish itself in the light motorcycle market haven't been as successful and have largely been abandoned since the 1978 sale of its Italian Aermacchi subsidiary, the company re-entered the middleweight market in 2014 with its Street series of motorcycles.